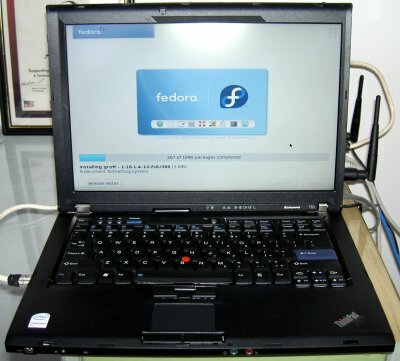 I’ve been running Fedora 8 on a Thinkpad R61i, which is very similar to your new laptop. The biggest difference is the lack of a card reader or touchpad on my model, assuming yours also has an Intel X3100 graphics chipset. The only problem I’ve experienced with it is that when coming out of sleep mode, the backlight stays dark. If I switch to console and back to X, the backlight comes on again. There’s an option to fix this (I had it working right under Fedora 7) but I haven’t had time to do so yet. I also am running FC8 on a Thinkpad R60. I have yet to get the internal wifi card to work. I’ve tried everything but to no avail. Any insight would be greatly appreciated. I’ve done madwifi etc… but no such luck. Mine “just works.” What wireless chipset does your laptop have? The wireless chip on this machine is a Intel 4965. I had problems to make it work on Linux just because apps are not intuitive enough. But Fedora 8 has everything needed to make it work. RPM package iw4965 should be installed by default. One thing I noticed: You won’t be able to connect to a WiFi network via the old system-config-network admin tool. Don’t ask me why. You will have to start NetworkManager and NetworkManagerDispatcher system services so your desktop will show (after relogin) the connection icons on the tray. Then activate wireless connections and a dropdown box will appear with the WiFi networks found. Then just put your WEP or WPA or whatever key and you are done. Do brightness keys (‘Fn+Home’ and ‘Fn+End’) work? Petrosyan, Gnome detects them because something appears on the screen when I press it, but the brightness does not change, and this program that captures this action is slow and inneficient and almost hangs the system. Hey, where did you get that Avi? For a long time I’ve been looking for a Thinkpad here in Brazil for a affordable price. Unfortunately you can find only HP, Dell, Sony and Toshiba models here under R$3000. Avi, add yourself to this bug https://bugzilla.redhat.com/show_bug.cgi?id=363261 regarding broken brightness keys.